Practical advice for modern relationships through the timeless values of Buddhism. A complete introduction to Buddhism for modern Westerners. Limitless space and joy, the highest view of Diamond Way Buddhism. Lama Ole Nydahl's adventurous path to Tibetan Buddhism. The risks and joys from twenty years on the road bringing Tibetan Buddhism to the west. on Amazon.com. Available in hardcover and Kindle format. For centuries Tibetan Buddhist masters have uncovered joy and meaning in the dying process. For them death is not a mystery. They know what will happen and see it as a great chance for spiritual development. Fearless Death makes their teachings accessible to the modern West. 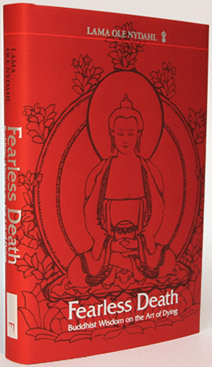 In Fearless Death Lama Ole Nydahl condenses the information he learned from years spent with great Buddhist masters in the East. His explanations are enriched by decades of experience guiding modern people through the dying process. This book is proof that the wisdom of Tibetan masters now lives on in the West. In 1968 Lama Ole and his wife Hannah began training with masters of the Kagyu and Nyingma schools of Tibetan Buddhism in the Himalayas. In 1972, Lama Ole learned the rare meditation practice of conscious dying (Phowa) according to the wishes of his teacher, the great 16th Karmapa Rangjung Rigpe Dorje. Since then he has taught the Phowa practice to over 90,000 people throughout the western world. People are less afraid of things they can understand. This is also true about death. With Phowa training and the knowledge found in this book it is possible to transform fear, expectation and doubt into confidence and a calm state of mind when facing death. Can meditation help us in death? How can I help someone who is dying? Does Buddhism have insight into death and dying? What is the latest scientific research on what happens when we die? How is Lama Ole Nydahl an authority on death and dying? "This excellent book about death and dying... will be extremely helpful for people to prepare for their own death, and to lose their fear of dying, knowing now that death is just the end of our physical aspects but not of our consciousness... This book could be of great help in daily medical practice in the Western world, where death is still a huge taboo as a result of widespread ignorance. Highly recommended." — Pim van Lommel, M.D. The Conscious Dying practice that Lama Ole teaches was passed down through the greatest masters of Tibetan Buddhism, including Padmasambhava, Yeshe Tsogyal, Longchen Rabjam, and the 20th century masters Jamyang Chokyi Lodro and Dilgo Khyentse Rinpoche. Lama Ole Nydahl and wife Hannah with their teacher H.H. the 16th Karmapa Rangjung Rigpe Dorje.